FAMILY GAME NIGHT: Host Todd Newton, A Life of Games! 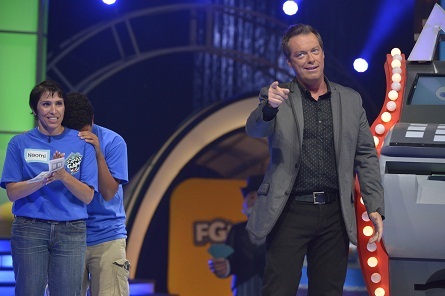 The new season of the Hub Network’s Hasbro board games turned larger than life sized is back with Emmy Award winning host Todd Newton, but minus announcer Burton Richardson. We asked why Richardson had not returned, and the circumstances were unclear. Newton also said that “most of our audience members are comprised of people that are fans of the show. Since we started ‘Family Game Night’ over two years ago, the whole concept has been lets create moments that matter for families. And lets do things that families can do together. We’ve really upped the family togetherness this season by including all different types of families and more families are playing.” Now there are six , seven, eight families playing in a single game. Executive Producer Barry Poznick stated that families are given a packet of the game rules of all the games that are in rotation, a release form, then they’re given T-Shirts so they are all matching. They are shown videos that go over the rules with the families. “We want to give them the most success rate when they get here,” he said. For children to play, the minimum age is eight, the maximum age is sixteen. (Far Left) Todd Newton getting ready for a game of “Battleship”. This season, “Family Game Night” is run slightly different behind the scenes. 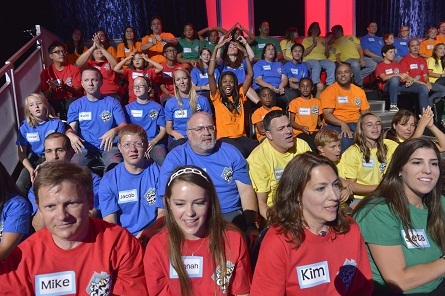 Last season, they taped four to five shows per day with the a fixed group of families that would all take a shot at the same game before moving on to the next one, allowing for higher energy coming from the players and audience. 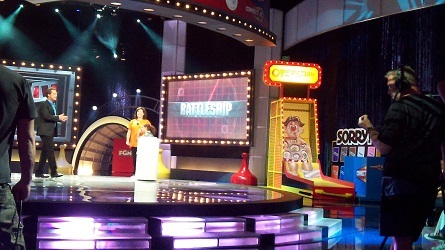 This season, the show is filmed more similar to real-time and family players are called out from the audience. Newton said that they film two to three shows per day now allowing him to finish around 6pm, versus 8 or 9pm last season. Advice that Newton gives up-and-coming youths that are inspired to get into game show hosting at a time where networks are hiring celebrities, to just follow the career of other great hosts and start at a radio station. 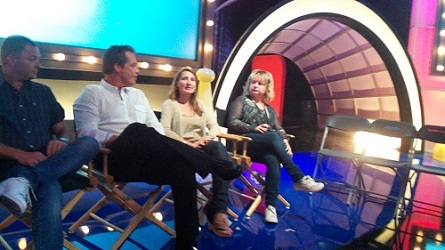 Working with great game show mentors throughout his years Newton said he learned that the host is not the star of the show, “the game is the star of the show.” He said what he loves the most about being a game show host is sharing the experiences with the contestants, as well as seeing the experiences through the contestants eyes and tries to channel into their excitement. He says this puts a whole different perspective on it. Newton wrote a book about is life in game shows called, “Life in the Bonus Round”. It’s available on his website. Soles for Soles – one dollar from Newton’s personal profit goes to this charity towards one child in Haiti getting a pair of shoes.